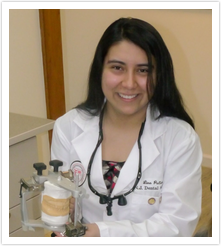 Dr. Lina Pulido received her undergraduate degree from The College of New Jersey, where she graduate with a B.S. in Biology and Minor in Fine Arts. She completed her dental education at Rutgers School of Dental Medicine. During dental school, she helped promote oral health by participating in the Hispanic Dental Association- New Jersey Student Chapter. She also took interest in pediatric dentistry and furthered her knowledge by attending summer pediatric externship programs at Columbia University Medical Center’s Pediatric Dentistry Residency Program and Temple University Hospital Pediatric Residency Program. Dr. Lina believes in the importance of explaining dental treatments to patients and enjoys educating them about ways to improve their dental health. She treats every single one of her patients as family. She meticulously plans and individualizes every treatment plan for her patients, giving them options as well. Further, Dr. Lina has a special affinity to children and can put even the most nervous child at ease. On her spare time, Dr. Lina enjoys volunteering with Caregiver Volunteers of Central Jersey and The Eudes Foundation. Caregivers is a non-profit organization that helps the senior population of Central New Jersey. The Eudes Foundation is a non-profit organization that takes care of children with HIV/AIDS in Colombia.